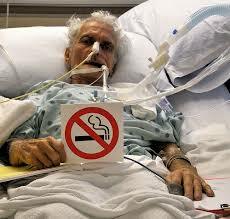 COPD - Chronic Obstructive Pulmonary Disease Often caused by Smoking. COPD (chronic obstructive pulmonary disease) is a progressive disorder of the airways that restricts airflow and reduces the performance of the alveoli (air sacs in the lungs). As the name suggests the diseases are chronic and include bronchitis and emphysema. Asthma and asthmatic bronchitis are acute and intermittent however, the symptoms and causes of these conditions overlap so much that the term COPD is used to refer to asthma, bronchitis and emphysema. 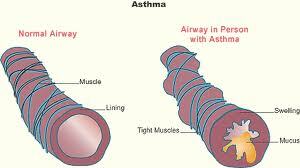 Asthma affects around 6% of the population of the USA. There are several forms each characterised by unusually sensitive and irritable air conducting passageways that respond to irritants by constricting; known as bronchospasm. Bronchitis is an inflammation and swelling of the bronchiole lining leading to over-production of mucous. The most characteristic symptom is frequent coughing with large amounts of mucous. 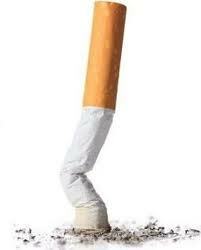 An estimated 20% of adult males have chronic bronchitis a condition most commonly related to smoking. Over time the increased mucous production can block smaller airways and reduce air exchange and respiratory efficiency. Chronic bacterial infections leading to more lung damage are common. Treatment involves stopping smoking and the administration of bronchodilators, antibiotics and oxygen as necessary. Emphysema is a chronic progressive condition characterised by shortness of breath and an inability to tolerate physical exertion. The underlying problem is the destruction of respiratory exchange surfaces. In essence, the functions of the alveoli and bronchioles are eliminated. This disease changes the anatomy of the lungs. The lung tissue responsible for gas exchange is impaired. The process of swapping oxygen for carbon dioxide is interfered with because the alveoli are over-inflated. The small bronchioles need to stay open in order to allow gases to leave on exhalation but because they are damaged through smoking the gases are trapped in the air sacs. If the air sacs contain trapped gases there is nowhere for new oxygen inhaled into the lungs to go and nowhere for necessary gas exchange to take place. Bell Valves are a relatively new medical breakthrough which are successfully providing some relief for emphysema sufferers. The bell valves hold the damaged alveoli open so that the gases can escape. It is not a cure. Emphysema is a COPD which is a progressive disease and is not able to be cured. Asthma can be managed by medication but the asthmatic person must take care to avoid irritants that may cause an asthma attack. Bronchitis can be treated but often returns frequently in the person with compromised lung health. 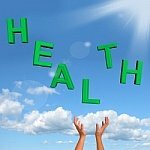 Return from "COPD" to "How to Quit Smoking"